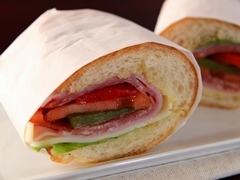 What types of sandwiches do your customers want? We can help. Why pay attention to your sandwich menu? 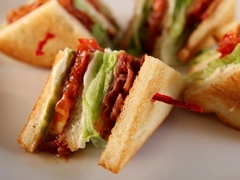 85% of consumers said they had purchased a sandwich away from home at least once in the past 60 days. * That's up from 20% two years previous. And among those who purchased in the last two months, the average consumption is 3.8 sandwiches per week. That's a lot of sandwiches. How are you capturing that business? 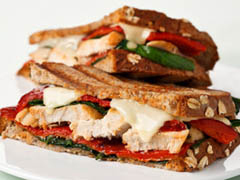 One out of three consumers polled (34%) say they would pay more for higher-quality sandwich ingredients. Not surprisingly, customers say that the most important aspects of a good sandwich are meat quality (84%), bread quality (77%), cheese quality (71%) and condiment/sandwich spread quality (48%). * The devil, then, is in the details. BREADS: Whole-wheat/whole-grain, Italian, baguette, ciabatta, bagel and multi-grain are the top breads preferred by consumers for lunch and dinner sandwiches. 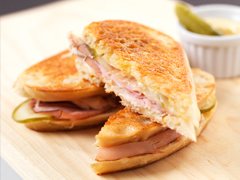 MEATS: Chicken breast, roast beef, ham, bacon and turkey breast are consumers' top choices for lunch/dinner sandwich meats. CHEESE: Cheddar, mozzarella, Swiss, Monterey Jack, Havarti and feta top the list of cheeses consumers like in their lunch/dinner sandwiches. VEGETABLES: Lettuce, tomato, cucumber, onion and green pepper are consumers' top five choices for lunch/dinner sandwich toppings. "Add a premium touch with your vegetable offering—oven-roasted tomato instead of everyday tomato, caramelized onion outshines white onion and roasted red pepper replaces bell pepper," says Kira Smith, corporate chef, Kraft Foodservice. 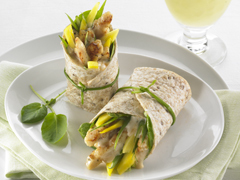 Make your sandwiches sing with wonderful flavour and texture. 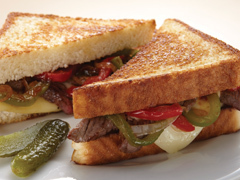 Our chefs at Kraft Foodservice worked up delicious recipes designed for your sandwich board. Toasted sandwiches are hot. More consumers today (52%) than in 2010 (46%) say they don't mind waiting a little while for a sandwich to be toasted or grilled. * These recipes make it worth the wait with crisp texture and melded flavours. Kraft Mayo Real Mayonnaise or Kraft Miracle Whip Spread is the sandwich condiment of choice at both lunch (48%) and dinner (42%). Another fifth of consumers say they would be likely to order flavoured mayonnaise on their sandwich at lunch (23%) and dinner (21%). * With a few quick add-ins, make your spreads craveable. Source: Sandwich Consumer Trend Report (Canada), 2012, by Technomic.